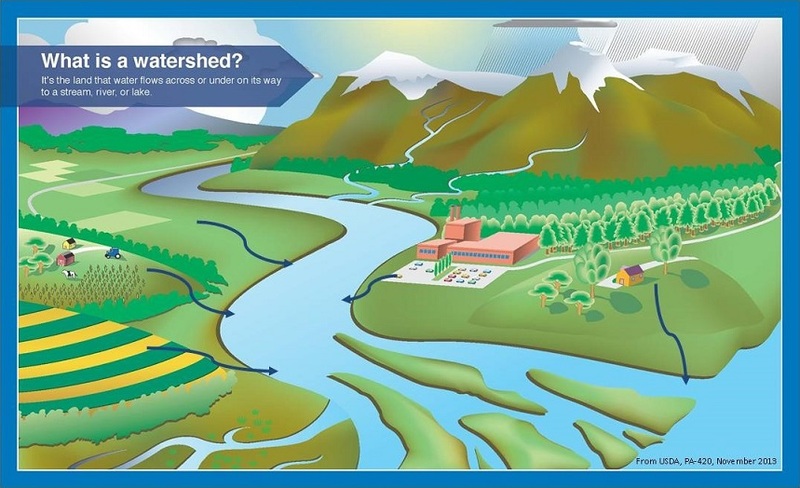 A Watershed is an area of land that water flows from the highest point to the lowest point on its way to a stream, river, lake, and eventually to the ocean. It not only includes water that flows across the land (surface water), it also includes the water that flows though the land (groundwater). The watershed includes mountains, fields, orchards, parking areas, yards and plowed fields. We all live within a watershed and have a watershed community. Our watershed community includes not only the streams and areas mentioned above; it also consists of animals, birds, trees, plants, fish, insects and you. Even the air that surrounds us and the soil we walk on is part of the watershed community. Everything we do can affect this community. 71% of the Earth’s surface is covered with water. This may seem like a lot. However all the water on our planet cannot be used by us. 97% is saltwater which we cannot consume. 2% is freshwater that we do not have access to because it is either too deep in the ground or is locked up as ice. 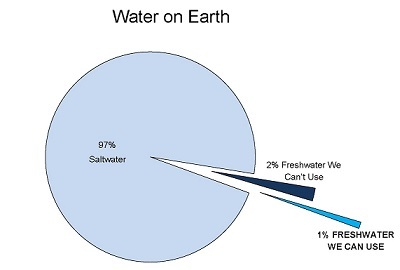 That leaves only 1% as freshwater we can use! This is why we need to protect our watersheds from pollution since they are a vital source of freshwater for all of us. We impact our watershed by not picking up after our pets, using too much fertilizer or pesticides on our yards and gardens, by not maintaining our vehicles and littering. All these actions can impact our watersheds by affecting the water quality within it via pollution. When the water and land becomes polluted, it affects every living organism within them. This variety of life within the ecosystems of our watershed community is called biodiversity. When the biodiversity decreases, the ecosystems are impaired and unable to maintain a healthy environment. Invasive species, plants and animals not native to an area, can start to take over, further damaging the watershed community. To learn more about watersheds, please visit the USEPA’s Healthy Watersheds site at https://www.epa.gov/hwp.